Robbie MacIntyre manages a small post office in the old Station House on the outskirts of sleepy Barton Hartshourn, northwest of London. He's stunned when the owner, Maggie, who's a close friend, bequeaths him the post office and the Station House. Then, there's a box that holds several rare first editions and a cookbook. Only when the secrets of the ingredients in a particular recipe are finally revealed does everything begin to make sense, and a love cut short 70 years earlier is finally discovered. Tails of the Curious Cookbook is the series name for an anthology of five short stories by five great writers. The writers, R.J. Scott, Amy Lane, Marie Sexton, Amber Kell, and Mary Calmes have written vastly different M/M romance stories with the unifying theme of a curious cookbook entitled Recipes for the Heart subtitled Mystical Meals and Dangerous Desserts hand written by the anonymous Granny B. The stories come in either a Kindle e-book or audible format. The cookbook is depicted as very old, tattered, faded, leather bound, and rich with notations from its users adding clarifying notations and reactions to the varies magical recipes. The recipes when prepared and served is intended to aid in sorting out some confusing romance aspect of the stories or make one feel better after a broken heart. These books will appeal to those with a romantic soul and believe in the magic of comfort food served with a side of the power of suggestion of magic. 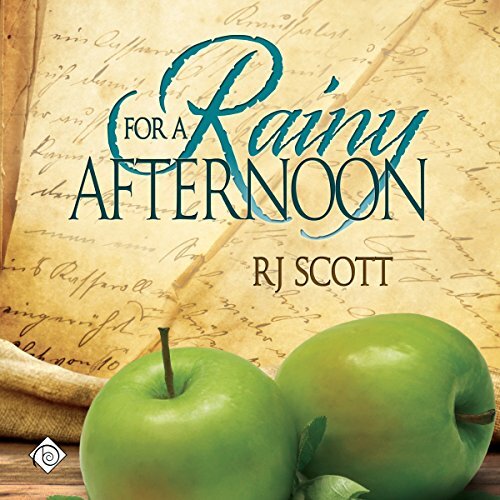 For a Rainy Afternoon: Tails of the Curious Cookbook by R.J. Scott narrated by Ian Gordon. This tale is set in a small English country village named Barton Hartshourn. It has a nostalgic element of two brothers who meet two English sisters and fall in love during World War II. Sadly one brother is killed in a bombing raid over Germany and the other sister marries her yank and returns to America. The remaining English sister, Maggie, becomes an author and resides in Apple Cottage. Years later Maggie befriends Robbie MacIntyre, a recent un-rooted University graduate, and sets him up in a small tea shop, library, and post office business in an old Station House. Upon her death she wills the Station House to Robbie and Apple Cottage to her American grandnephew Jason Young (also a budding author). Through the device of the magical cookbook Maggie match makes romance beyond the grave between the two main characters. This is an utterly charming story well narrated by Mr. Gordon. This story will have your heart smiling and feeling in love. No angst, no drama, just a feel good story for a rainy. This is a wonderful story of lost love and new love found in a small hamlet in Britain.